The “TEXAS TRIANGLE is projected to grow by 3.5 million between now and 2030. The entire area will become one giant metropolis with a 19 percent growth in residents—from 18.14 million in 2015 to 21.65 million in 2030—bringing it close to the current population of the New York City metro area (20.18 million people). TEXAS TRIANGLE: Economic Engine of the Southwest U.S.
No region has seen more dramatic and steady economic and demographic growth than the Texas Triangle, formed by the Dallas-Fort Worth metro at its northern point in North Texas; the Houston metro at its southeastern edge on the Gulf Coast; and Austin-San Antonio at its western tip in Central Texas. The growth of these areas has transformed Texas from a largely agricultural and commodities-producing state into a highly urbanized and economically sophisticated place. Together the metropolitan areas of the Texas Triangle have a population of more than 18 million residents. The Texas Triangle metros together account for more than 66% of the population of Texas and 77% of the GDP of the nation’s second largest state. This emergence is now globally acknowledged. In terms of economic strength, each of the Texas Triangle metros ranked among the top six strongest urban areas in the nation in a post-recession analysis by the Praxis group and their economic output together would position the Texas Triangle as the fifth strongest regional economy in the U.S. in a framework created by metropolitan scholar Richard Florida. The fact that these measurements use a variety of factors suggests the powerful and pervasive nature of the Texas urban ascendency. One way to look at the importance of the Texas Triangle is to examine the vital and often quite unique economic contributions which each metropolitan area contributes to the nation’s well-being. 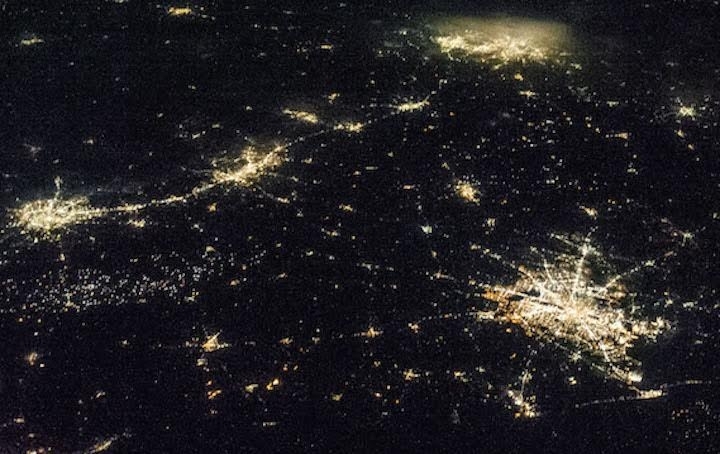 Houston is the acknowledged energy capital of the world with its complex of energy headquarters, financing institutions, research centers, and petroleum processing and transportation facilities. Its medical center houses more clinical institutions and life sciences research facilities than any other medical complex in the world. Dallas-Fort Worth is an established financial center, telecommunications pioneer, and its two airports are the hubs of flights connecting the Southwestern U.S. to the nation and to the world. It has become a favored location for corporate expansions and relocations for both domestic and foreign companies. Austin and San Antonio are connected by 75 miles of continuous urbanization, including the vital region around San Marcos and a string of the fastest growing small cities in the nation. Austin is home to world-class companies, particularly in technology, the University of Texas, and also is home to the government of the nation’s second largest state. San Antonio is home to the nation’s second largest concentration of cybersecurity companies, to three major Armed Forces commands, to an international automotive manufacturing hub centered on Toyota, and to the most visited destinations in the state, the Alamo and the Riverwalk. Although not as established as a global center as the metropolitan networks on the East and West coasts, the Texas Triangle now occupies an increasingly important place among the world’s commercial centers. There are now 53 Fortune 500 firms headquartered in the Triangle metros, including American Airlines, AT&T, and Exxon Mobil in Dallas-Fort Worth; USAA and Valero, and Whole Foods in San Antonio and Austin; and Conoco-Phillips and Halliburton in Houston. Global headquarters, such as Occidental Petroleum, and national operational headquarters, such as those of Toyota USA and Mitsubishi Heavy Industries, underscore that the global role of the Texas Triangle is ascendant. The Texas Triangle is also home to a concentration of high-quality higher education. Nationally-ranked research institutions such as the University of Texas at Austin and Rice University in Houston are joined by such major public institutions as the University of Houston; the University of Texas campuses at San Antonio, Dallas, and Arlington; and the Texas A&M campus in San Antonio. Excellent private institutions include Southern Methodist University in Dallas, Texas Christian University in Fort Worth, and Trinity University and Incarnate Word University in San Antonio. Within the geographic expense of the Texas Triangle are such powerhouses as Texas A&M University in College Station and Baylor University in Waco. The Texas Triangle is connected to the commercial centers of the globe through its impressive transportation assets. The Port of Houston is the second largest port by volume of tonnage in the U.S. The state boosts major airline hubs for American Airlines at DFW Airport, for United Airlines at George Bush Houston International, and for Southwest Airlines at Love Field in Dallas, as well as extensive international airline connections from Austin and San Antonio. Major cargo volumes flow on the state’s highway grid, most notably on the NAFTA Highway, IH-35, which delineates the western spine of the Texas Triangle and expedites the greatest volume of international freight from any inland port to markets across the nation. This economic ascendency owes much to pro – business Texas policies, largely embraced by both major political parties, that stress job creation and wage growth as the best strategies for continued and broadened prosperity. Investments in roads, water, power, broadband, ports and essential public facilities, such as higher education campuses, remain priorities in state and municipal budgets. But what really makes the Triangle grow is its people, animated by the spirit of new opportunity luring work-ready in-migrants from other states and ambitious immigrants from around the world. Texas attracts investors, entrepreneurs, researchers, inventors, and workers who recognize a state committed to reducing barriers to economic success and to creating the financial, educational, and physical conditions for growth and upward mobility. That combination of the policy regime, the physical facilities, and the human energies has created an economic juggernaut now claiming its place among the great commercial networks of the world. The nation can look to the Texas Triangle for future breakthroughs in innovative products and creative services. But beyond that the world can look to the Texas Triangle for examples of cities that combine a passion for growth with a determination to improve the lives of people. Our geographic and multifamily specialization are key tenants to our investment strategy.